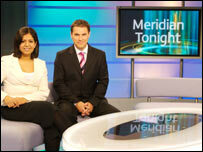 Broadcaster ITV is hoping to reduce its number of regional newsrooms from 17 to nine by merging some services. The broadcaster aims to save between £35m and £40m a year to invest in programmes with the closures, but must get permission from regulator Ofcom. The London, Granada and Wales regional services will be the only ones unaffected by the proposed changes. The mergers are part of ITV boss Michael Grade's five-year plan to improve programming. As part of the shake-up ITV plans to merge its West and Westcountry news shows - but the new programme would include short, recorded sections containing additional local content. The same is planned for the Border and Tyne Tees regions as well as the East and West Midlands and the Meridian and Thames Valley areas. In a letter to staff, Mr Grade warned that the current set-up is not sustainable. He said that if steps are not taken to save money now, the firm "could end up losing entirely something that - had we acted sooner - could have been sustained". However, broadcast union Bectu criticised the move saying it marked a "further significant and damaging step by the broadcaster away from its public service broadcasting" commitments. The union added the "swingeing" cuts would leave many of the 1,045 people currently employed by the ITV News Group at risk of losing their job. He wants to double the amount ITV makes from its content to £1.2bn by 2012, but any extra spending will have to come from saving money throughout the business. It also plans to sell some non-core assets such as its stakes in the websites of Arsenal and Liverpool football clubs. Q&A: What lies ahead for ITV?